Peter Jones in the London office of Edmiston & Company tells me that he's signed the central agency for sale of Benetti's 36.6m motor yacht Quest. 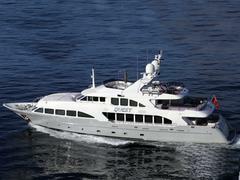 Launched earlier in 2009, the luxury yacht's had minimal usage and is currently lying in Italy, available for inspection. With a fresh and light limed oak interior, Quest has accommodation for up to 12 guests in a master, two doubles that can covert into a large VIP and two twins, each with a Pullman berth. Built to ABS class and MCA compliant, Quest is on the market asking €9.75 million.